When I was growing up my mother would give me a new pair of pajamas and a cozy pair of socks on Christmas Eve. It was the perfect little touch that made me even more excited for Christmas day. There’s something about a nice pair of socks that just feels special and it doesn’t get any better than these beauties from Solmate Socks! These socks are the perfect stocking stuffer for everyone on your list. Marianne Wakerlin (the founder of Solmate Socks) started her company in 2000 from a spare bedroom in her rural, Vermont home. She had been hand knitting these socks as gifts for family and friends for 20 years, so she decided to turn her passion into a business. Marianne then found a small, family-owned knitting mill in North Carolina that could partner with her to produce her designs. To this day, Solmate Socks are proudly crafted in the USA. As you guys know, I’m an avid knitter (as are many of you!) I think we can all appreciate the beautiful work that goes into making a pair of socks like these! As you as you hold them in your hands, you can tell that these socks are high quality. Each set of socks is purposely mismatched. It’s a fun and whimsical touch that shows everyone that these aren’t ordinary socks! Solmate Socks come is sizes for women, men, children and babies. These are a stocking stuffer that won’t be forgotten about by New Year’s! These socks are perfect for lounging around the house, but they also look great peeking out from the top of your boots. Aside from being beautiful, Solmate Socks are eco-friendly! 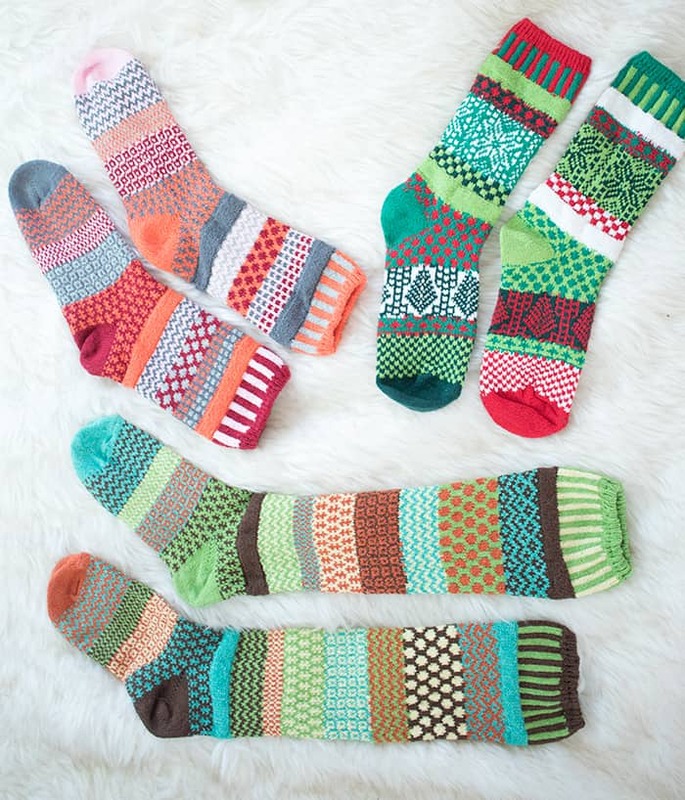 They’re knit with recycled yarn and Solmate Socks abides by a zero-waste manufacturing policy. Isn’t that amazing??? Solmate Socks doesn’t just stop at your feet! They also carry accessories like hats, scarves and fingerless mittens. Want your own pair of Solmate Socks? (Of course you do!) Use code “FUNSOCKS” for free shipping. Expires December 31st, 2017. Offer not valid on expedited orders.